Five fully lined fish boxes, storage for 16 rods, a side-entry console with enough storage room for all kinds of dive gear or an optional head, even a walk-through transom—surely we’re talking about something bigger than a 23′ boat, right? No, the Bluewater 2350 offers one of the largest aft cockpits of any boat of similar length and still gives you all those features and more. More includes (among other things) a 35-gallon circulating live well with light, a well-insulated console cooler and a transom rigging station with sink and cutting board. 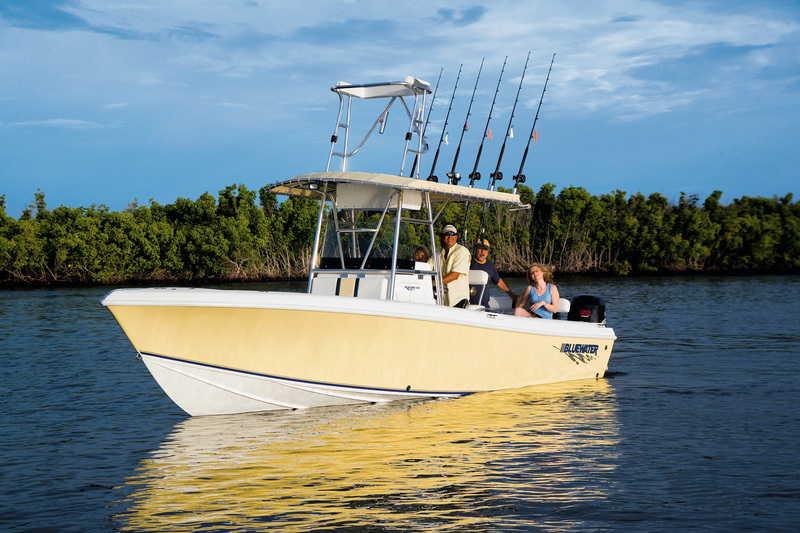 Now factor in the 130-gallon alloy fuel tank to feed single or optional twin power, Bluewater’s proven hull design and ideal weight distribution and you have a cat-quick fishing machine that lets you run far and wide without getting pounded, no matter how the seas are running. Like all Bluewaters, the 2350 is built to order. With the boating industry’s widest choice of options to choose from—from tops and seating configurations to an instrument panel customized with your choice of electronics—your 2350 will be as versatile as you choose to make her. Click here to download all the specifications. To view the Bluewater 2350 gallery click here.